Stuff Points: Earn 47 points when you buy this stuff. These high quality rubber building blocks are truly unique. They are large in size, and are constructed from a natural rubber material. This allows them to be 100% biodegradable and also incredibly durable. Soft and squishy to the touch, yet sturdy and durable to handle abuse and give kids the ability to easily stack them. The colorful pieces will gently bounce when tossed, and squish when stepped on, making them safer and less painful when used indoors. Wood blocks can be dangerous when children throw them, or when a tower is knocked down. Plastic blocks and bricks have the same problems, and most sets of both kinds include pieces that are quite small, so they exclude smaller children. These great rubber building blocks are nice and soft, so they are far less likely to hurt someone or break anything when someone gets carried away, or an accident happens. The softness also makes them easier to grip and hold on to for small hands, so your kids will play with them longer, and have better success while they use them. Despite being soft and squishy, Rubbablox are quite sturdy, and stack easily. The clever design of these blocks only adds to the fun. This set includes 9 large cubes and 14 cylindrical connectors. This combination allows little ones to easily and securely stack the blocks vertically or horizontally. The smaller cylinder pieces will fit snuggly into the circular indentation on the colorful cubes in order to hold them together. Children can also stack and build more traditionally, using the different pieces by themselves as well. Pile all of the cylinders on top of each other to build a tower, or insert them into the squares to form solid cubes to build a wall. Use a combination to leave the center open on one or more cube to create windows and doors. 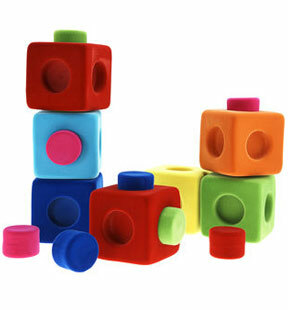 The possibilities are endless with this great building block set. They are tactile and great for early spatial learning. Rubbabu is a unique alternative to traditoinal building blocks and they offer a more tactile experience. Made from natural rubber foam and covered with bright, colorful flocking, they are soft to the touch, squeezable and super durable. Perfect for child care centers, teachers, parents, or anyone interested in providing a truly unique set of blocks for learning and enjoyment. The large soft shapes are perfect for little fingers, and the bright colors and unique texture will keep children engaged for longer periods of time. When held, children can appreciate the texture and squishiness, while increasing their sensory awareness. They are great for children of all ages. Smaller kids will reach for, roll and crawl to them. Older children end up stacking and building to construct large creations. Rubbablox BUilding Blocks are perfect for the development of socialization and gross motor skills as well as sensory enhancement. Block Dimensions 3.5" x 3.5" x 3.5"
Uses Building, Stacking, Sorting, etc. Bright colors, unique design and natural rubber construction make these a must have toy. The perfect alternative to traditional building blocks. Order Yours Today! For what age group is the Rubbablox set recommended? Your webpage says 2+ years, but the NYC Metropolitan Museum webpage appears to show the same product for ages 6 months to 3 years. Does one of the the sites have a typo? Are the circular Rubbablox large enough to not be a choking hazard? Are they porous like s sponge and Nerf products or made of harder plastic? Yes. Age would be up to discretion. They are great for 6 month olds or younger in some cases. You don't want to give them to an unattended teether that will scrape off the coating though. The soft flocking should not be ingested, but that is the only real age limitation. The circular pieces are too big to be a choking hazard. As far as density goes, they will be far less porous than foam toys. These are sturdy natural rubber with a fun coating, not air filled foam. Do the Rubbablox sets come in bags/containers? If yes, and I ordered 2 sets, would they come in one bag or box or other kind of container?? Yes they come in a zippered vinyl bag with handle. Each set is individually packaged, so if you order two, they would each come in their own bag.